At the core of every great photographer is the uncanny ability to capture a subject from a unique perspective. Finding the best angle for a particular photo is the most important part of great photo composition. Drones allow photographers to capture dramatic landscape imagery from unique bird’s eye view perspectives that were previously a significant challenge. Equipped with a drone, you can create some truly stunning pieces of art. 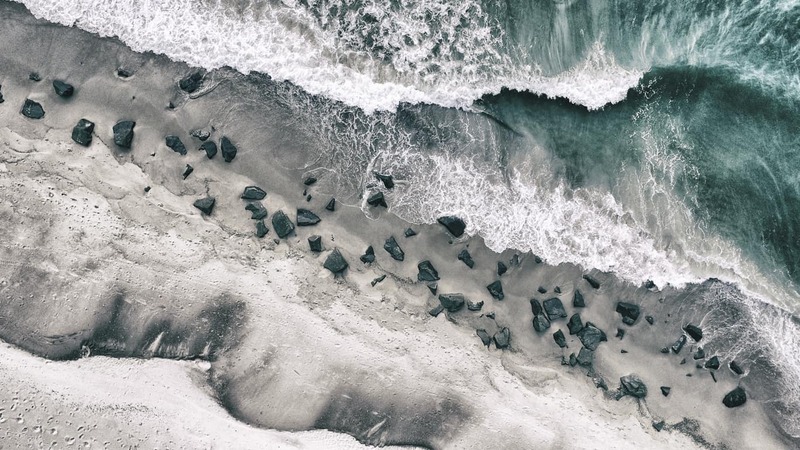 After all, the varied landscapes we have at our disposal offer tons of textures, colors, patterns, and other features to give drone photos an otherworldly look. 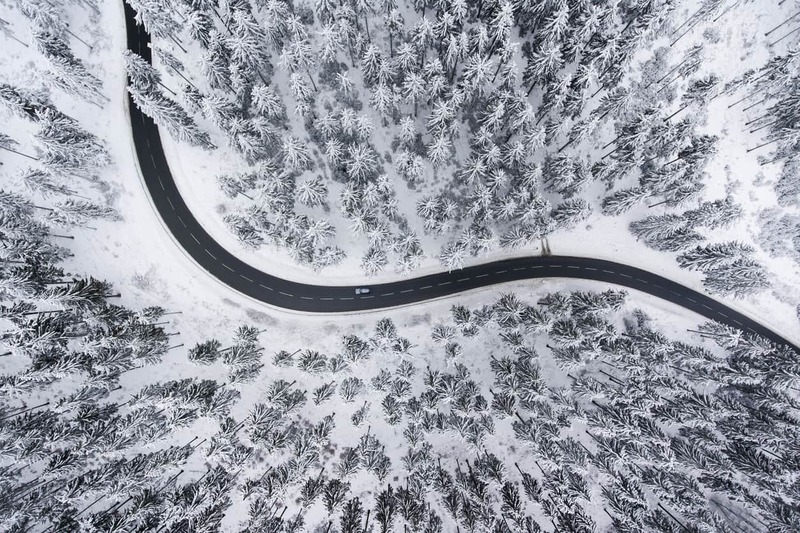 Here's a small collection of photos to help inspire your drone-based landscape photography. There are two things that jump out at me about this photo. First is the road, which winds its way through the forest like a ribbon. Not only does that leading line help move our eyes from one side of the photo to the other, but it also helps break up the texture created by the trees. Speaking of which, that texture is the other feature that really sets this picture apart. The top-down view of the trees highlights the texture, creating an image with great depth. That's important because sometimes images taken at an extreme downward angle can feel flat. 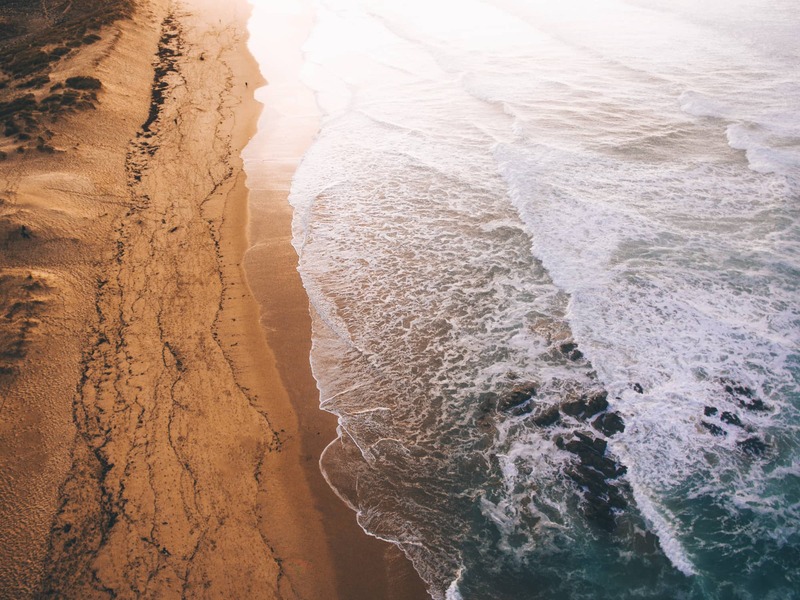 When you tackle landscapes with your drone, look for ways to add texture to enhance the depth of the shot. Editor's Tip: For the ultimate experience in drone photography, we suggest getting outfitted with the DJI Inspire 2 X7 Premium Pack. This kit has everything you need to photograph gorgeous landscapes, including the Zenmuse X7 gimbal camera, intelligent flight batteries with a portable power pack, a remote, a premium lens filter pack, and so much more. It's a complete drone system with all the accessories you need. Learn more about this phenomenal aircraft at Drone World. This photo shows how repeating lines help give structure to the shot. 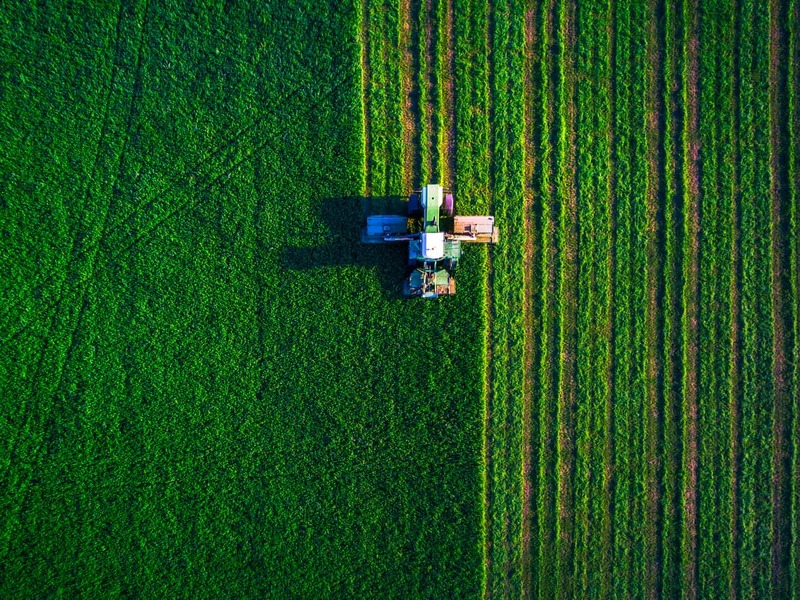 Rather than lead our eyes across the image like the previous example, these lines break up the sea of green of the field. The resulting image has visual tension from left to right that makes for a much more interesting viewing experience. That visual tension is enhanced with the placement of the tractor in the middle of the frame. Though placing the subject in the middle of the image is usually problematic, in this case it works beautifully. 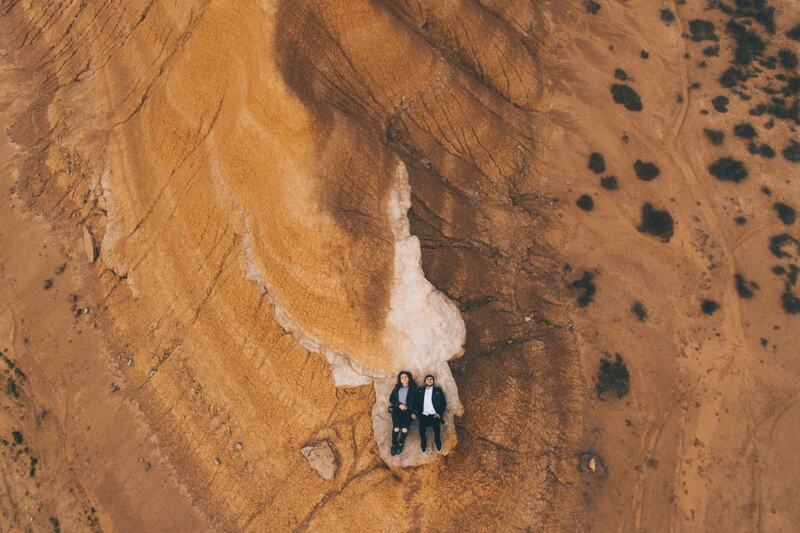 Adding people to your drone photos is another way to create an interesting dynamic. In this case, without the two people in the shot, it would be difficult to determine how large the landscape features are. However, their inclusion in this photo makes it easier to understand the size and scale of the rock. Essentially, they serve as a reference point and provide visual clues to help us grasp the scope of the rock formation and the world that surrounds them. Additionally, this landscape is relatively devoid of color. Though there are beautiful textures happening, it begged for something else to grab our attention. The inclusion of the people helps do just that. When taking a landscape photo from ground level, one of the most important rules in the book is maintaining straight horizons. However, when using a drone to photograph a landscape from above, you can throw that rule out the window. In this example, you can see how framing the shot on a slightly diagonal plane creates a photo with much more visual interest. 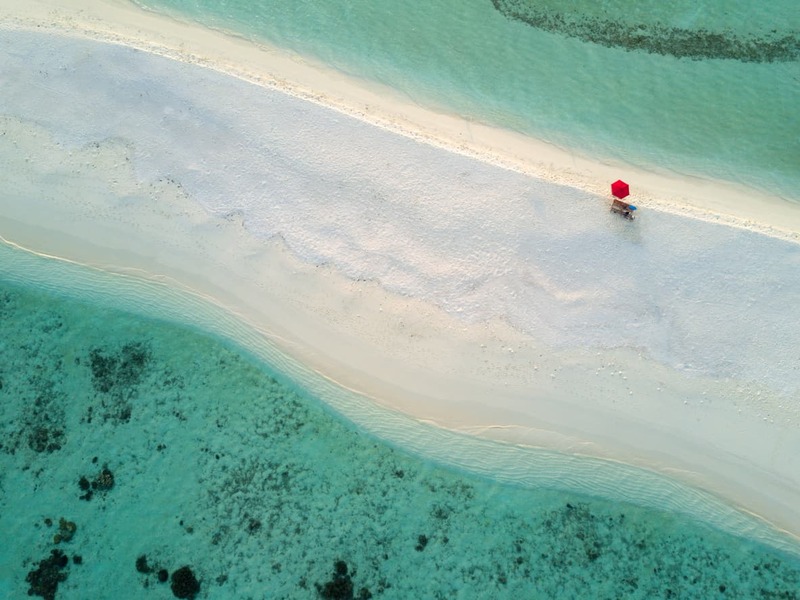 In other words, the manner in which all the lines in the photo lead from upper-left to lower-right help turn this beach scene into something more abstract and whimsical. Speaking of abstract, if you want to create a landscape photo with an impressionist vibe, try framing a close-up shot. The example above demonstrates the value of hovering at a lower altitude to achieve a tighter frame on the landscape. 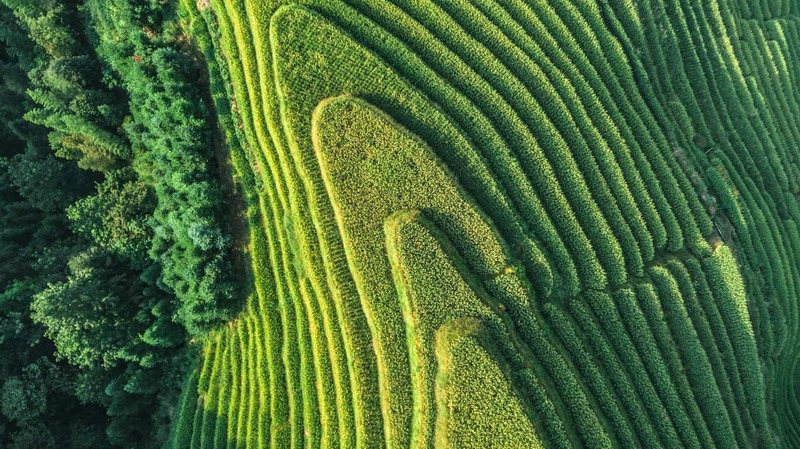 In this case, by framing out the larger landscape, the photographer highlighted the pattern created by the rice fields. Notice also how the photographer focused on analogous colors. The various shades of green give the shot beautiful continuity and provide an abstract tone. Editor's Tip: Fly and hover longer with the DJI Mavic Pro Fly More Combo. This kit comes with three batteries, a charging hub, and a car charger to keep your batteries ready for action. The Mavic Pro is equipped with an OccuSync transmission system that provides up to 4.3 miles of range and an obstacle avoidance system to ensure safe flying. Another method of creating a satisfying viewing experience is the minimal approach. In the photo above, the simplicity of the shot is what makes it so breathtakingly beautiful. As you can see, many of the attributes of the previous photos are present in this shot - the diagonal lines, the presence of different textures, and the use of muted colors. Plus, isolating the bright red umbrella in space enhances the feeling of minimalism. In other words, when taking photos with your drone, don't feel that you have to include as much as possible into the scene. Instead, utilize the techniques outlined here to create stunning visuals and capture your subject matter in dramatic and unique ways. Finally, as these photos demonstrate, you don't have to aim your camera out toward the horizon. Instead, look down, look around, and discover the abundance of abstract beauty that surrounds you.